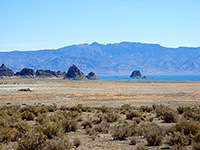 Sparks borders Reno to the northeast, beginning a few blocks from US 395 and extending 5 miles along I-80, as far as the foothills of the Pah Rah mountains. The interstate divides the southern, industrial/business section of the city from the larger residential district to the north; most hotels & large stores are found nearby, with a few other shopping centers along Oddie Blvd, McCarran Blvd and Pyramid Way. 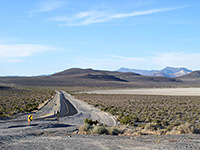 To the north, this latter street (Hwy 445) soon exits the city, heading along Spanish Springs Valley and through Mullen Pass to the beautiful but little visited Pyramid Lake and then eventually to the even more remote landscapes of the Black Rock Desert. East of Sparks, the next major city along the interstate is Fernley after 30 miles. The Residence Inn is one of two newly constructed hotels to open late 2018 on the edge of the Outlets at Sparks, facing Sparks Marina - on the east side of the city, 6 miles from downtown Reno. Besides the various shops and restaurants there is an IMAX theatre close by, and a casino under construction. The 104 room hotel offers suites in two bedroom, one bedroom and studio configurations, all including a fully equipped kitchen. Complimentary services are wi-fi, hot breakfast, weekday socials (Monday to Wednesday) and grocery delivery. Snacks and sundries can be purchased from a 24 hour market. The hotel also has a bbq area, outdoor pool, fitness center and meeting room. New for summer 2018, the Hampton Inn benefits from a quiet and scenic location overlooking Sparks Marina Park Lake, just a short drive from I-80 (Sparks Blvd exit) though well shielded from the interstate, by some of the buildings of The Outlets at Legends Mall. There are several restaurants in the vicinity, and the popular Wild Island water theme park is less then a mile away. The 102 room/suite hotel provides free hot breakfast (take-out version available), and has all the expected facilities for business, meetings and recreation. Right at the east edge of Sparks, the Fairfield Inn is the first hotel for travelers arriving on I-80, and offers 88 rooms on 3 floors, in a beautiful, clean building just north of exit 21 of the interstate (Vista Boulevard) - part of a business area though adjacent to the deserted foothills of the Pah Rah Mountains. The hotel provides above average free continental breakfast, and leisure amenities of an indoor pool, hot tub & fitness center. There are two fast food restaurants next door (Del Taco and McDonald's). The center of Reno lies 7 miles to the west, though the immediate neighborhood has its own attractions including Wild Island Family Adventure Waterpark (I-80 exit 20). The pet friendly, interior corridor Super 8 motel in Sparks is part of a travel center that also includes a restaurant, casino, gas station and extra large parking lot catering for dozens of trucks; half a mile from the Greg Street exit of I-80, right on the east edge of the city. Guests are a quarter of a mile from a walking trail along the Truckee River, and south facing rooms have good views across the valley to the mountains on the far side. The motel has gardens at the front, a tree-lined outdoor pool at one side, and interior facilities of a business center, free wi-fi and free continental breakfast. Whirlpool bath suites are available. Motel 6 Reno Sparks has a prominent but rather isolated location, surrounded on all sides by roads, including I-80 immediately south. Guest rooms are on two floors of an exterior corridor building, with the parking lot to the rear and a pleasant garden at the front, including an outdoor pool and a few shady trees. Other amenities are wi-fi, coin-operated laundry and free coffee. Rooms are available with microwave & refrigerator. There are several restaurants a short walk away, and two city parks within one mile.